Last year an Australian town made headlines by being the first to ban the sale of bottled water. This was done on the basis that water comes in plastic containers that “pollute” the environment. Now the health of the planet is important. So is the health of the people who live on it. The second pillar of health is water. The body is comprised of 70% water and to work at its optimum, water in the body needs to be turned over regularly. There are different recommendations for how much water people should drink each day. The standard recommendation is 2 litres per day. Another recommendation is to drink between 30-35ml per kg of bodyweight per day. So, a person who weighs 70kg will need 2.1 to 2.5 litres. This is the amount of water that is required to turn over just for day to day normal activity”. Some of the roles of water and hydration in the body are, transportation of nutrients, elimination of wastes, lubricating the joints and tissues, facilitating digestion, aiding concentration, keeping the skin looking younger and more vitality. If you are doing any physical activity, then you need more water. People who work outdoors on hot days may require four, five or six litres of water per day. Researchers have questioned the need for this amount of water each day, but there is not really any need for researchers to tell us the body needs water. To illustrate why the water in the body needs to turn over and move, think about a stagnant pool and a flowing river. A stagnant pond doesn’t sustain life because it has no energy about it. A flowing river sustains life and has a tremendous energy about it. The molecules of water are the same, but the difference is the molecules are moving in the case of the river and not in the stagnant pond. Water needs to move through and not stagnate in the body. Now an argument put up for the bottled water ban is that you can get water from the tap. That is true and whilst tap water is OK , have you ever seen what a water filter looks like after a few months use? We put one in at home and I was stunned when it was changed to see the amount of sludge and crud on the filter. Ordinarily my family would have consumed this. The filter picked it up and we didn’t. Bottled water is filtered and is better for us, even though tap water is OK and certainly is better than other beverages for hydrating the body. Furthermore can you go into a lunch bar or deli and buy a glass of water (and take it with you)? So the people in Bundanoon can drink fizzy or coloured drinks with lots of additives but not water even though the containers are the same and the effect on the environment is the same. Some say they do not like the taste of water of are just not used to drinking it. Here are some tips to overcome this. Squeeze lemon or orange juice into the water. If you’re not used to drinking much water, every time you have one glass, have a second. To start more gradually, have an extra half glass when you have one full glass of water and build it up from there. The aim is to get this to a stage where you actually miss your water if you don’t have it. People who spend much of their lives in a slightly dehydrated form don’t have a comparison. Common symptoms of this are tiredness headaches and problems concentrating. Once the body is hydrated, you will notice when your body is getting slightly dehydrated. This will send you running to replenish. When you are at this stage you have reached sustainability. 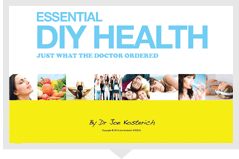 This article also appears on Prevention not Prescriptions another great site for health information.